Technology has been all-pervading. This does not leave cameras aside. We used to take photos to keep the moments from our life perfectly etched for eternity. But, times have changed considerably. The gadgets that we are always attached to have made us want for more advanced options. The videos speak more than the images. 4K has been the new standard in 2018, and that is exactly why we have been looking ahead for the 4K capable HDR Camcorders and action cameras you can buy in 2018. Check out a few options you can check out. 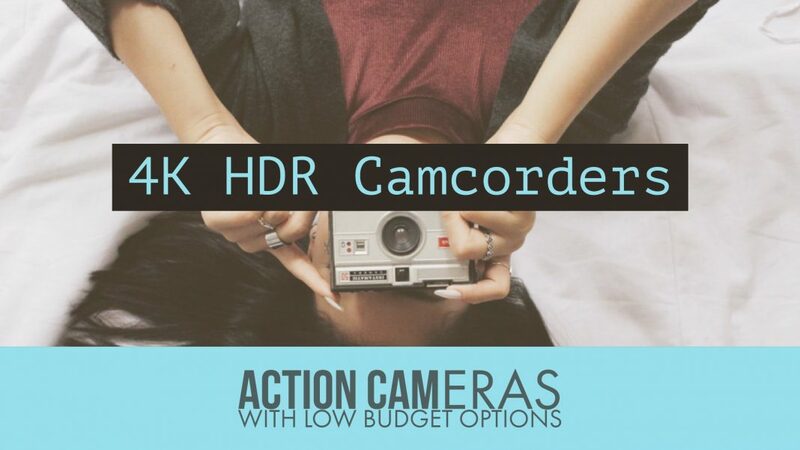 When looking for the best 4K HDR Camcorders and Action Cameras, the essential features you need to look for would be the ease of use the image quality. If you are about to use it for the professional photography requirements, you may also need to pay attention to the mounts and accessories you would get with it. Here are a few options you can give a thought to. GoPro has been a favorite name when it comes to cameras and allied products. The image quality should be the best that you would get among a host of devices. The compact and excellent looking device comes with the intuitive interface and interactive controls. The action camera offers you 4K video capture at 60fps, while HD video recording is available at 30 fps. The camera provides you 12 MP still images. The camcorder is capable of RAW image capture. 2-inch touchscreen and digital video stabilization. You have to waterproof up to 30 feet. It offers you a high-end digital stabilization. You also have the best selection of accessories. If you are trying to check out the best alternative for GoPro and considering the best 4K action cameras, Olympus TG-Tracker can be a great option you have. The brand has been quite popular and has been well known for feature-packed devices. The camera comes with an 8 MP resolution. You get a 1.5-inch screen that can tilt. It offers you advanced features like WiFi and GPS connectivity and action sensors. It can be considered to be perfect for the photographer in you. The minimal design makes it the best choice for the best in class portability. If your preference is for best image stabilization, nothing can beat a Sony. You can be assured of the best performer in the video and audio options. Waterproof construction is yet another feature that would make it worthy of selection. You can be ensured of 4K video capture at 30 fps and HD video recording at 1080p resolution. Get access to 12 MP still images and 10fps burst shots. High end optical and digital stabilization. Get access to WiFi and GPS connectivity. Waterproof up to 197 feet. Garmin is the best option for you if you are looking to shoot 360-degree videos. The shockproof and water resistant camcorder up to 33 feet, Garmin offers you live streaming functionality as well. The rugged body offers you exceptional performance and durability. Capable of 4K video at 30 fps and 5.7k video at 30 fps. You can have access to Still images at 15 MP resolution. Live streaming capabilities would put it way ahead of the other options included in this list. You can also operate it through voice commands. The camcorder comes with a bundled tripod. The Garmin Virb 360 is an expensive option among the action cameras featured in this compilation, but the features and freebies justify the high price. Yl 4K Camera has been a hot favorite with most of the camera buffs, more so in the action camera category. The looks would be what would attract you the first thing you find it. It is attractive and full of features. The smaller, darker and sleeker camcorder just does have all the features you expect from it. You can shoot 4K videos at 30 fps and HD videos in 1080p and up to 120 fps. The still I age resolution would read 12 MP. It offers you up to 120 minutes of video recording on a single full charge. It can record videos at 4K, 1080p and 720p resolutions. You have access to several modes including but not limited to slow motion, timer and time lapse. The camcorder offers you all the features in a small package. But, yes – you will not get the waterproof functionality, so no rain shots, please! You get an optional case, though. Well, that was our compilation for the best 4K HDR camcorders and action cameras combination. Though not exhaustive in any way, we would assume that the products featured in this compilation should go a long way in making this one of the original listings that would be helpful for any photography enthusiast. In fact, we have attempted to include a model from each of the top contender brands rather than choosing two models from the same brand. This has been done intentionally as there are several capable camcorders from each of the brands we have chosen. In fact, some buyers always have brand loyalty, and as such the decision to include all the major brands that have a good portfolio of 4K HDR camcorders and action cameras. Have you used any of the devices that we have featured in this compilation? If you have, do share your opinions, views, and experiences with these models and manufacturers. If you think we have missed any of the camcorders worthy of being here, do let us know about them as well. We may consider adding them to our list when we update this post.